On this noteworthy day, which was made so by the arrival of Dave’s brother, Mike DeMoney, for his first visit to the Côte d’Azur, we had the great pleasure of finding Paul Allen’s Mega Yacht, Octopus, in its normal berth at Port Vauban here in Antibes. It’s been quite some time since we’ve spotted the 414-foot Lürssen, which held the distinction of the world’s largest Mega Yacht in 2004. Although it has slipped down a couple of notches from its 2004 ranking, its size still takes one’s breath away, and it most certainly dwarfs every other yacht we’ve seen anywhere. 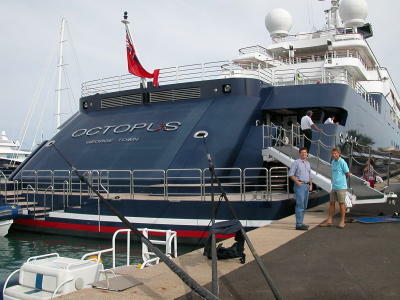 Also notable about Octopus is its professional recording studio and cinema, along with its glass-bottom lounge on the lower deck, its two helicopter pads, its full-length basketball court, and its personal submarine. The yacht is currently in Grand Cayman. He has been here before but not in the octopus another one of his yachats a white one i do not know the name. Awesome isn't it? I wrote a little something about the Octopus too...now it's gone though (unless it was just gone for an outing this morning when I ran by the port at 8h)...like you! I had hoped to see you again, but it will have to wait, I guess. Maybe I'll get an update sometime? ?